This captive Gyrfalcon was photographed in 2006 in Nome, AK with the tripod-mounted Canon 500mm f/4L IS (soon to be replaced by the Canon 500mm f/4L IS II) and the EOS-1Ds Mark II (now replaced by the EOS-1D Mark III soon to be replaced by the EOS-1DX; confused?) ISO 400. Evaluative metering +1/3 stop: 1/800 sec. at f/10 in Manual mode. Central sensor One-Shot AF and recompose. Click on the image for a larger version. This bird belonged to licensed falconer John Earthman. Captive bird images were eligible to be entered in the recently concluded BIRDS AS ART 1st International Bird Photography Competition. Click here to view and judge the best images in the Captive category or read on for additional details. 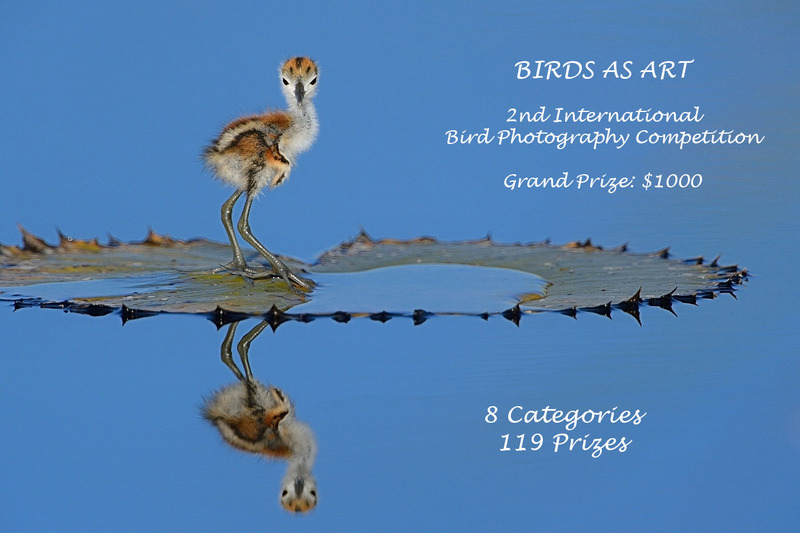 The judging has been completed in the BIRDS AS ART 1st International Bird Photography Competition. We are thrilled with the quality of the winning and honored images. Over the course of the next few weeks each of you will have a chance to judge the selected images in each contest category. A tally of the public vote along with the actual winning images for each category will be announced approximately 48 hours after each posting. The ten images that went to the judges in the Captive category have been posted. Join the fun and compare your eye and photographic vision with those of the five skilled professional judges. Click here to view the images and to add your votes to the tally. This pair of adult Purple Martins was photographed at Bay City, Oregon with the tripod-mounted Canon 800mm f/5.L IS lens, the 1.4X III TC, and the Canon EOS-1D Mark IV. ISO 400. Evaluative metering at +1 1/3 stops as framed: 1/125 sec. at f/20 in Manual mode at 7:37 am on a clear morning. Central sensor (by necessity) AI Servo/Rear Focus AF on the front bird’s face and re-compose. Click here if you missed the Rear Focus Tutorial. Click on the image for a larger version. Here, I went to f/20 in an effort to render both birds sharp. Compare these settings with those on the images that appear in the Purple Martin Magic blog post here. See the image processing animated GIF below. I continue to put in 20+ hours a week towards making the blog informative, timely, and beautiful. And it has been paying off. The blog alone had 462,178 page views and 3,839,749 hits in March 2012 alone! Most of the educational features that formerly appeared in BAA Bulletins now grace the BAA Blog. If you are not subscribed you are missing a ton of great stuff almost daily. You can subscribe to the blog posts by clicking here. If you have a problem subscribing, please contact us via e-mail. Below are some recent posts of interest. Cast your vote for the best images in the Captive Category in the BIRDS AS ART 1st International Bird Photography Competition by clicking here. See and learn about a unique Purple Martin colony in Purple Martin Magic. See the results of the Nature’s Best Image Quiz here. Check out “EOS-1DX, EOS-5D Mark III, & EOS-1D Mark IV Thoughts” here. Everything that you ever wanted to know about Canon telphoto lenses in a simple, easy to read chart. You will surely want to bookmark this post. Learn to optimize your images quickly and expertly. You will learn exactly how I convert and process my images in Digital Basics which includes my complete digital workflow as well as dozens and dozens of Photoshop tips. In the Purple Martin image above I corrected the color cast in the original image using a Selective Color adjustment on the WHITEs, added a Layer Mask, and then erased the two birds. In the animated GIF above note also that I have sharpened the bird’s faces with a contrast mask and lightened them with a Curves adjustment on that layer. If you are tired of ruining your images instead of improving them you need a copy of Digital Basics now. Photographic Travels with Charlie, Charlie MacPherson that is. Click here for Charlie’s blog. Click here for info on the Kaktovik, Alaska Polar Bear Tour. And click here for info on photography classes at the South Shore Natural Science Center in Norwell, MA and the South Shore YMCA in Hanover, MA. The above is a paid advertisement. David McNicholas is offering a used Canon EOS-60D digital camera body in excellent condition–no marks and no problems, for sale for $800; insured shipping at the buyer’s expense. In the original box with all cables, straps, manuals,battery, charger and software disc. Includes one 2GB SD memory card. SHIPPING : within the US at buyers expense. For more information or to purchase contact David by e-mail dmcnicholas@comcast.net or on his mobile phone at 973-452-4940. Click here. Select one of four current Canon camera bodies–both the EOS-5D Mark III and the EOS-7D are in the group. Add a lens–there are 30 in the group, a Series III teleconverter, or a Speedlite, and enjoy large double rebates. The lenses include lots of my favorites: the 70-200mm f/4 L IS, the 70-200mm f/2.8L IS II, the circle lens, the 180 macro, and the 300mm f/4L IS. You can check the specs on all Canon telephoto lenses here. This double rebate offer expires on April 2, 2012. Click here for details. Offer includes the brand new D3200 and the D7000. Below is a list of the gear talked about in this blog post. Thanks a stack to all who have used the Shopper’s Guide links to purchase their gear as a thank you for all the free information that we bring you on the Blog and in the Bulletins. Before you purchase anything be sure to check out the advice in our Shopper’s Guide. Canon 800mm f/5.6L IS lens. Right now this is my all time favorite super-telephoto lens.